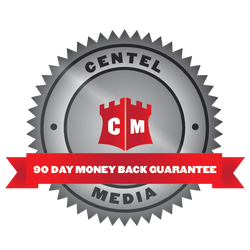 At Centel Media, we guarantee we will create at least 12 positive assets on the first three pages of Google, Yahoo and Bing within the first 90 days of starting with us. If this fails to occur, you may cancel your account with us and receive a 100 percent refund. Through our guarantee, we want you to understand just how committed we are to bettering and maintaining your online reputation. As a client, you should be assured that the services you ask for are completed. They should not only be fulfilled, but they should be done in an exemplary fashion. We guarantee 12 positive assets because this ensures your company really is put in a positive light—any fewer assets, and new negative comments could outweigh the positive. This is where managing and maintaining your reputation comes in. These positive assets should provide a cushion for incoming comments. Positive assets include your company’s site pages, blogs and any other ongoing work presented by the company, social media pages that are connected to your company, such as Twitter and Facebook, positive press releases, etc. Besides increasing recognition for your positive assets, we will do research negative assets and immediately work to suppress them effectively. Our staff writers and marketers will be working with you to promote wellness for your company brand. We guarantee the best results, which is why we are the best online reputation management company out there. For a more in depth look at our products and services disclaimers, please click on the icons (located on this page) to learn more.